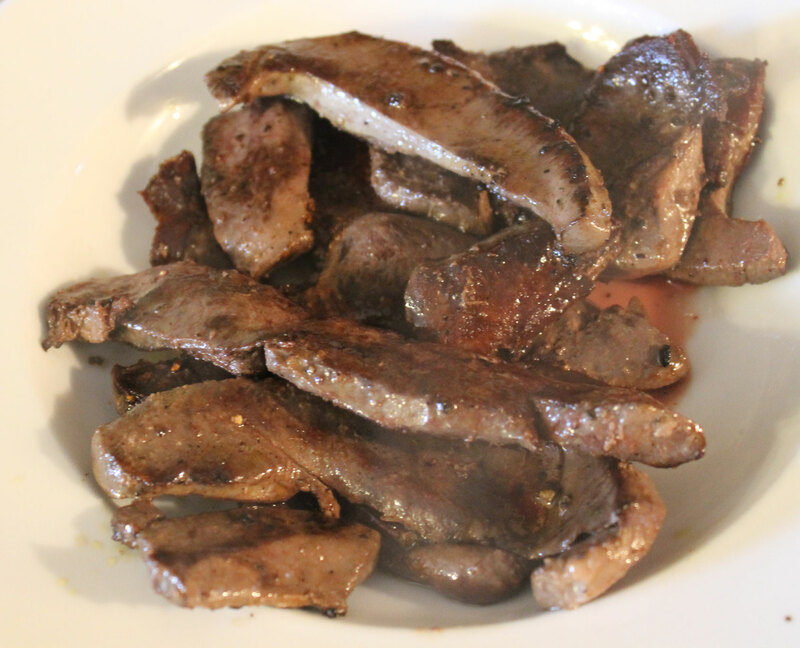 We eat a lot of organ meat – it is very good for you. In fact it is some of the most nutrient dense food that you can put in your bodies. As a family, we love to eat elk organ meat that we buy from Wapiti Ways at the Calgary Farmers Market. It is delicious, it is very economical, and a little goes a long way because it is so nutrient dense. For this particular meal, I cooked Elk Heart. Unlike a lot of organ meats, heart is not “squishy” and it does not taste “livery”. It has the texture of very finely grained meat, and tastes almost like steak. Because heart can be tough it needs to either be stewed for a very long time to tenderize it, or it needs to be served very rare – I always go for the very rare option – I don’t want to ruin the wonderful stuff. And really, it is almost like the best steak you have ever eaten. 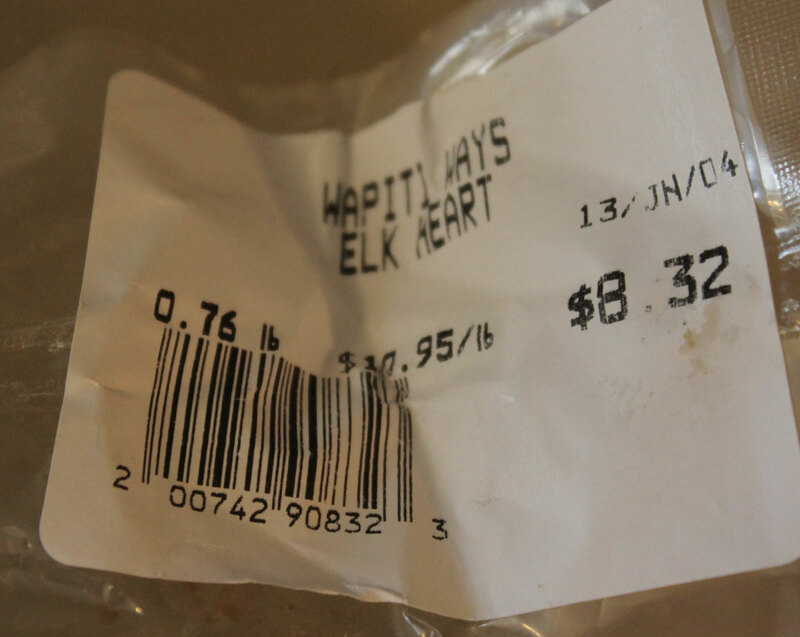 As you can see, the pack of elk heart I used weighed only 3/4 of a pound – and it was a very cheap meal in that the main protein ingredient cost less than $10… And seriously, this was enough to feed all 6 of us. Granted there were not a lot of leftovers (just some greens and a couple of sweet potato rounds), but no one left the table feeling hungry. 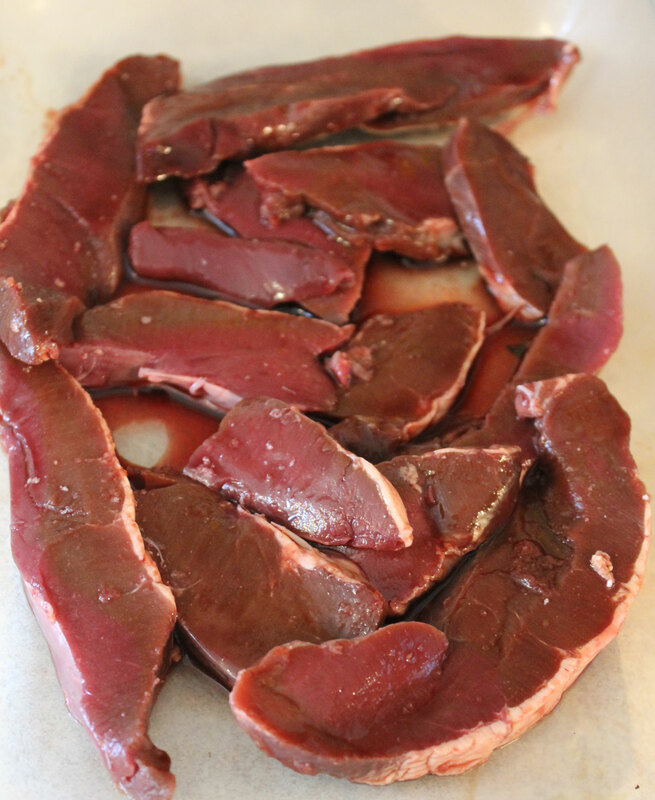 First of all, take your elk heart out of the packet and season it with salt. If you need to, trim off the excess fat. I didn’t bother with my heart. Leave it sitting in the fridge while you prepare the mushroom and caramelized onion topping. Take your bacon and toss it into a small skillet. Cook over a medium heat until most of the fat has run out and the bacon is crispy. Remove the bacon with a slotted spoon and set aside. Transfer half of the bacon fat to a larger skillet to be used for cooking the elk heart and reserve 1 tbsp to cook the greens. The remaining bacon fat will be used to cook the onion and mushroom topping. Add the onions, season well with salt and pepper and allow to cook slowly until golden brown and caramelized. This will take anything from 10 to 30 minutes. Don’t try to hurry it or have the heat too high or they will burn – Patience you must have my young Padawan…. oops sorry I may have geeked out a little there! Once the onions are soft and golden brown add the mushrooms and cook until the mushrooms are tender. Add back the bacon, taste and season if necessary. You probably won’t need any salt because of the bacon. Now cook the liver. You are going to cook it as if it was the finest steak – as rare as you can bear to eat it. Heat the bacon-fat in a large skillet over a high heat. Add the heart in a single layer and cook briefly until browned – no more than 2 minutes per side. Less if you can. Ideally you just want to sear it. Turn and cook the second side. 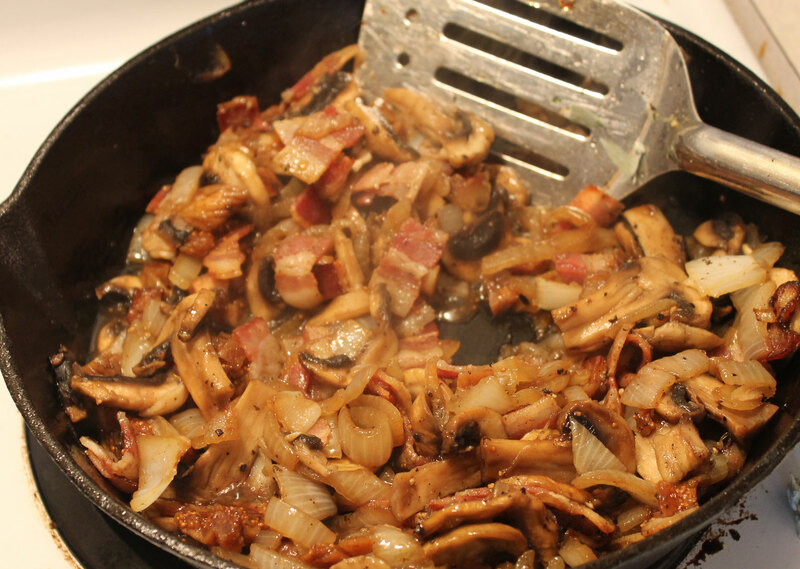 Allow to rest for 5 minutes then serve topped with the bacon, onion and mushroom mixture. Ideally, you will have started these before starting to cook the heart as they will take 40-50 minutes to cook. Preheat the oven to 375F/190C. Place a rimmed baking tray in the oven with 2 tbsp fat of your choice. 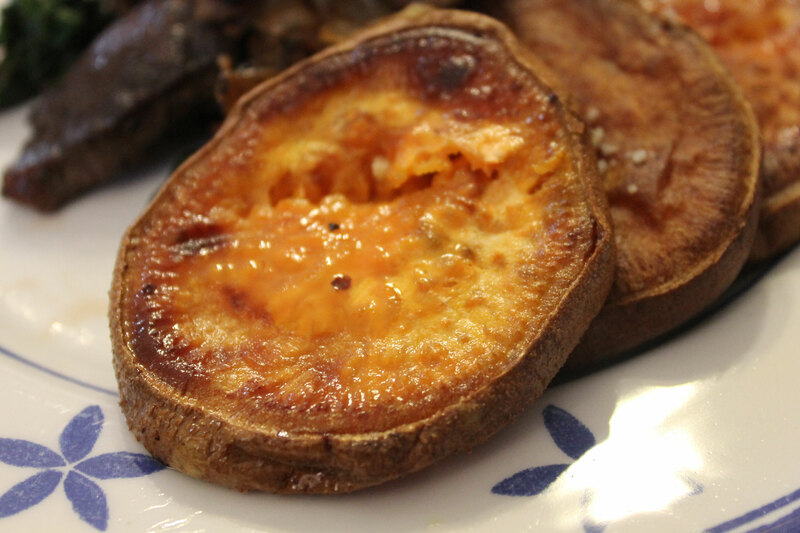 While that is heating and the fat is melting, slice the sweet potatoes in to 1/2 inch thick rounds – no need to peel them unless you want to. 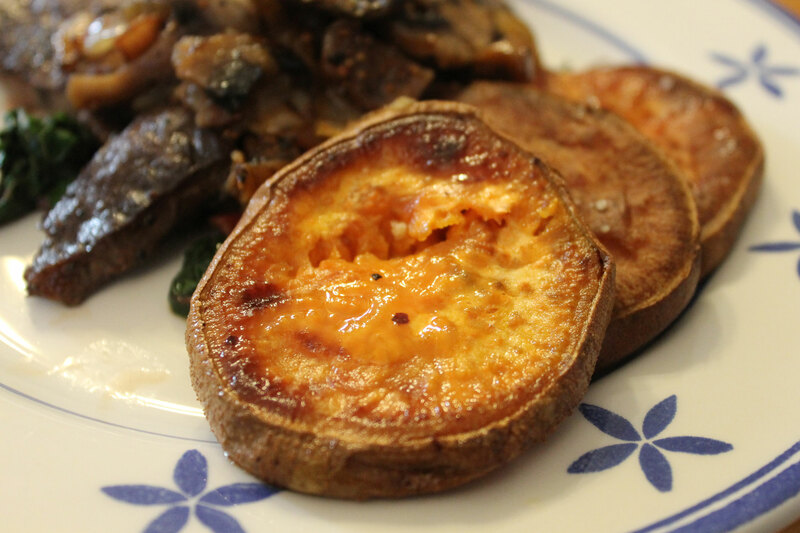 Once the fat is melted, sit the sweet potato rounds on the tray in a single layer. Sprinkle with a little salt. Pop in the oven and bake for around 20-25 minutes until the bottom of each slice is golden brown. Turn and repeat with the other side which may not take as long to brown as the first side. They are cooked when both sides are golden brown and the insides are tender. Total cooking time – 40-50 minutes. 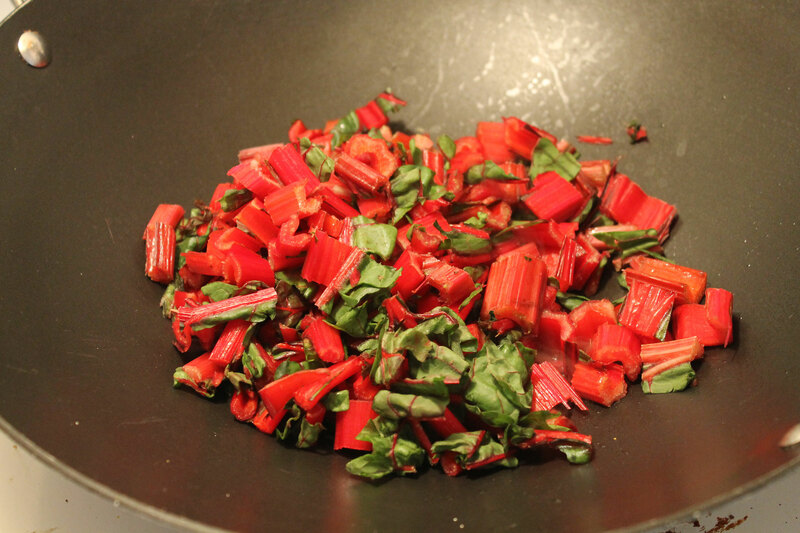 For the greens, trim the bottoms of the gorgeously red stems and cut off the green parts. Don’t discard the stems – we are going to cook those too. Melt the fat in a pan (I like to use a wok to cook greens) and while that is melting slice the stems into small bite-sized pieces. Throw in the pan with the fat and stir briefly. Then add the bone broth and allow to bubble. 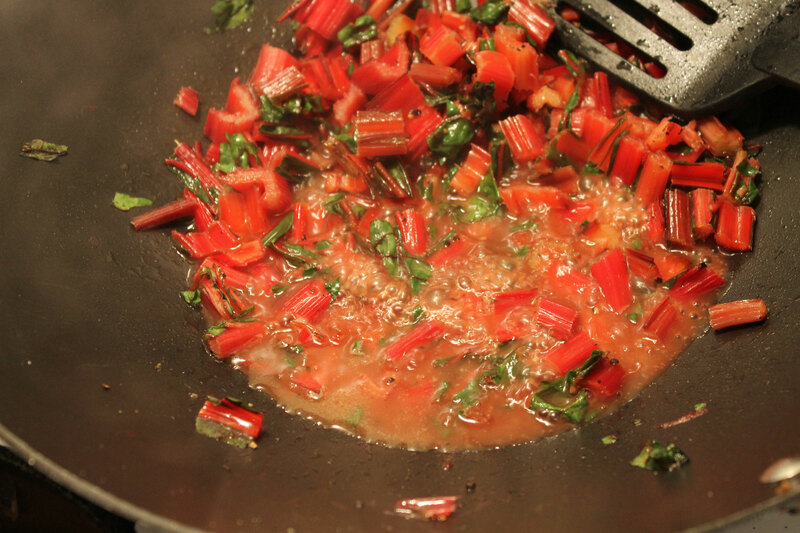 What you are essentially doing is steam-sauteeing the stems to tenderize them. 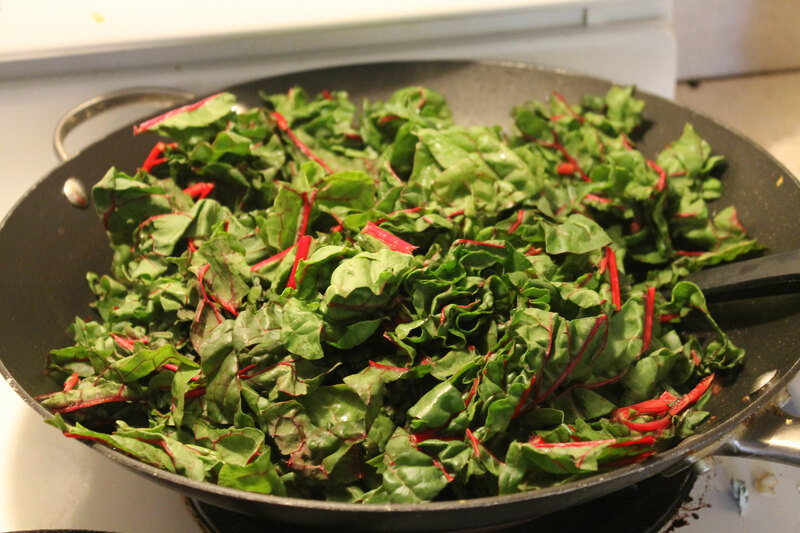 When the liquid in the pan is reduced to almost nothing, season to taste with a little salt, and then toss in the greens. 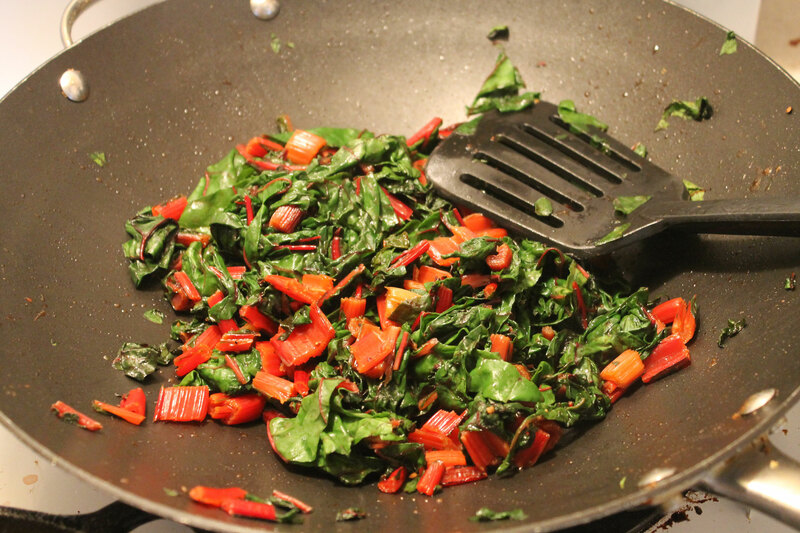 Toss and stir-fry until there is no liquid in the pan and the greens are wilted and tender. 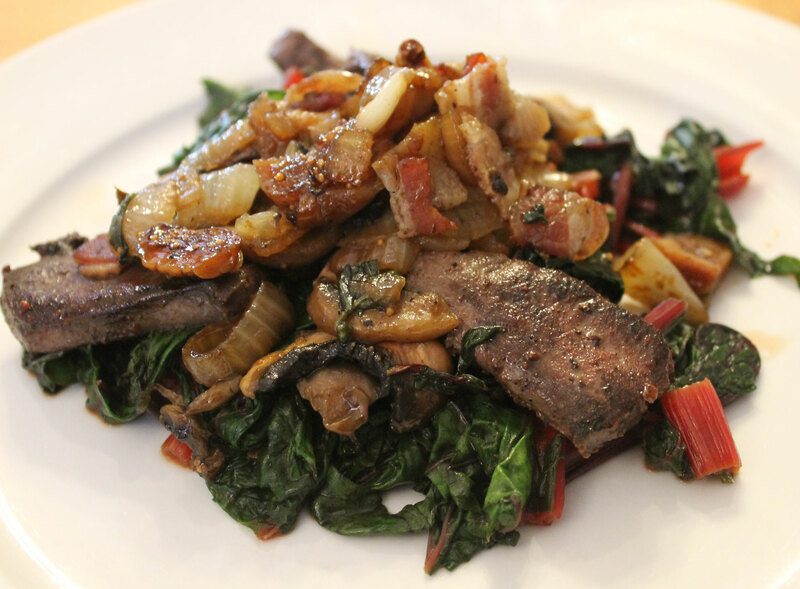 I put a bed of the cooked greens in the center of each plate and topped it with some of the elk heart. And then I put a big spoonful of the caramelized onion/bacon/mushroom topping on top. 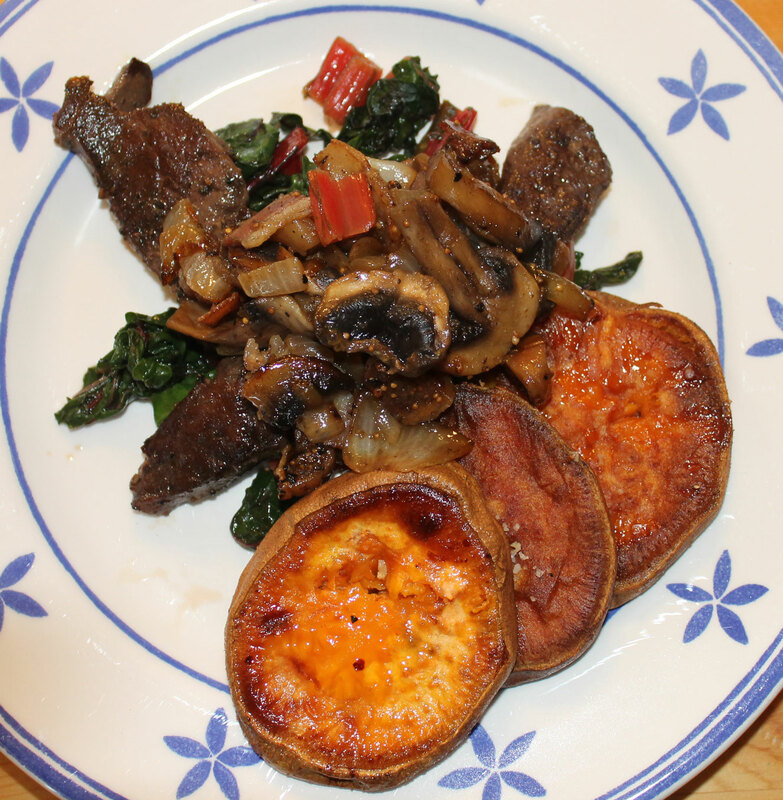 And finally I put 3 of the sweet potato rounds on each plate. And as for J – what did she do about the mushrooms? She was told to pick them out and leave them on the side of her plate, which she did with a disgusted look. 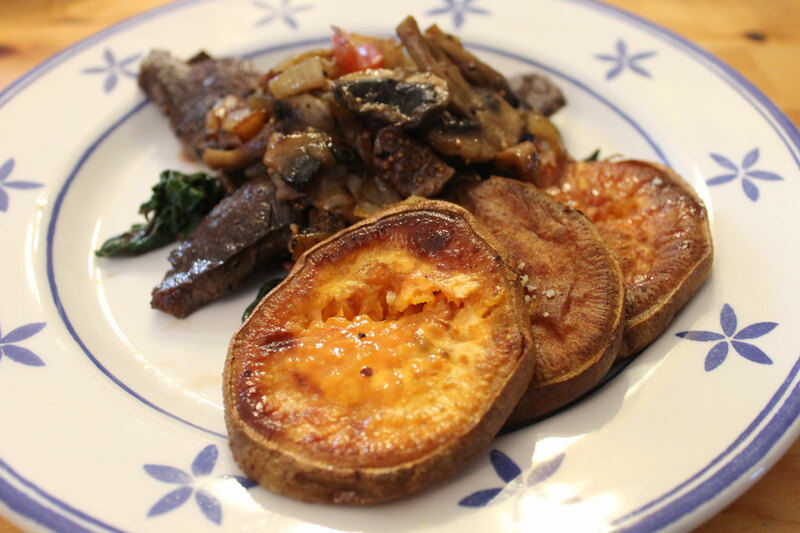 This entry was posted in Autoimmune Protocol Foods, Recipes and tagged AIP-friendly, elk, gluten-free, grain-free, Greens, healthy, heart, low carb, organ meats, paleo, primal, soy-free, sugar-free, sweet potato, wheat-free. Bookmark the permalink. 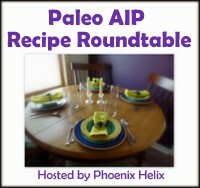 ← The Paleo-Vegan – a contradiction in terms!